Oh hey there! May I present to you....my very first savoury galette! 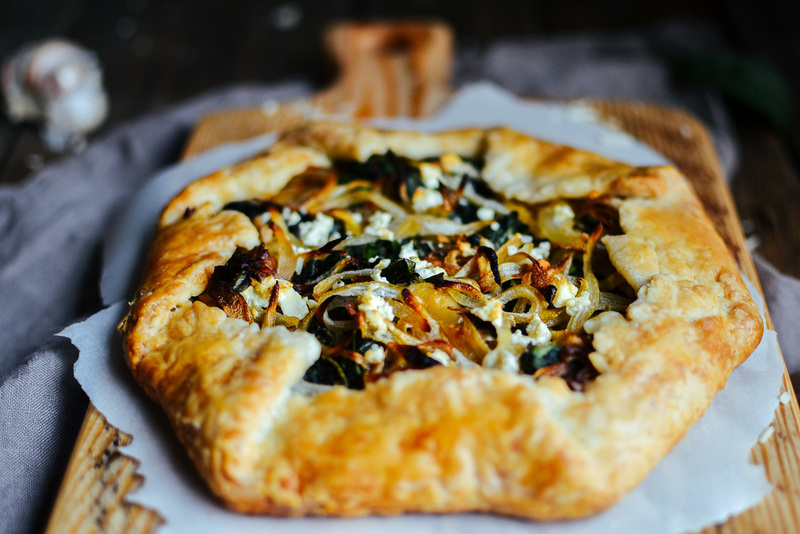 I've been seeing dreamy versions of savoury galettes all over pinterest made with roasted butternut squash and bacon, fig and goat cheese, mushroom and leek...the list goes on! I knew I needed this in my life immediately, and after much deliberation over ingredients, I decided to keep it simple. Spinach, sauteed onions, parmesan, and feta. Things that you probably have in your fridge right now! Pie dough lasts for several days in the fridge, or you can always freeze it, and then use it later! Our favourite recipe (here) makes quite a bit of dough, so it's nice to have leftover dough to make something else later in the week. Now if you're kind of nervous about pie dough, this is a good time to practice! Or you can always pick up some pre-made stuff, no worries! I'd say the toughest part about this recipe is the sauteeing of the onions. Oh man....it takes a while on a low temperature, and let me tell you that I am not the most patient person in the world. Ha! Besides, you could always make an actual pie, or a sweet galette, while you're waiting on your onions. Also, the measurements here are pretty loosey-goosey. If you want more spinach, add more spinach! If you want to make more than two, or make one giant one, or do 6 tiny ones....go for it! I prefer to stuff mine super full, but you do your thing! And can I just say that this isn't really a proper recipe, per se, but more of guidelines/an idea! Over a low heat, saute the onion in 1 tablespoon of oil, stir occasionally. This will take about 20-30 minutes. In a separate frying pan, saute spinach in the other tablespoon of oil over medium heat. Cover and let cook for about 5 minutes. Stir and cook for another 3-5 minutes. Roll out your pie dough into two circles about 8 inches in diameter, and about 1/4" thick. Sprinkle parmesan as the bottom layer, leaving a 1 inch border around each circle. Add spinach and then onions to each galette. Pile them high! Crumble a bit of feta over top. Fold up a small section of the dough to create the crust edge. Fold up a second section, which will slightly overlap with the first section. Gently press the two sections together. Repeat until all of the crust is folded up! You may want to dip your fingers in a bit of water to help folded sections stay together. Bake on a parchment lined baking sheet at 400 degrees F for about 30 minutes, or until the crust is golden brown.